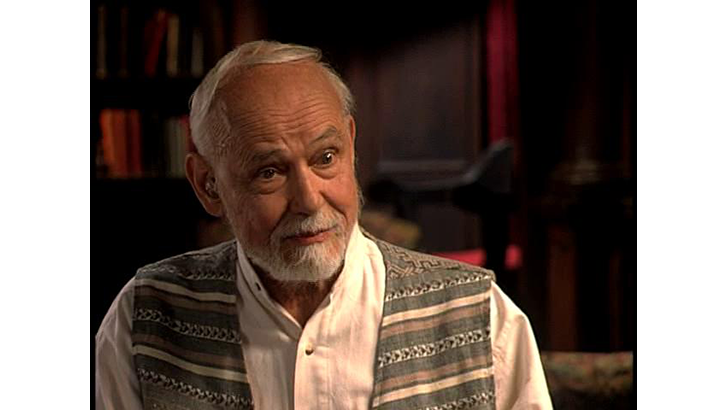 Photo: Smith appeared in the 1996 Billy Moyers television series The Wisdom of Faith with Huston Smith. In my most recent conversations with Huston Smith, he had expressed a wish to see for himself what lies beyond the veil. His wish was fulfilled on December 30, 2016. May he rest in the Real, "should there be one," as he might have added cautiously. Huston Smith was born to Methodist missionary parents in China, where he spent the first seventeen years of his life which are nostalgically recalled in his autobiography (Tales of Wonder, 2010). He set out to be one himself but soon discovered that he would rather teach than preach and found himself at the University of Chicago, where he obtained his PhD in 1945. He then taught at the University of Denver and Washington University at St. Louis before being hired by M.I.T. in 1958 to teach philosophy. Subsequently he went on to teach at Syracuse, and then at Berkeley after he had retired in San Francisco, rich in years and honors. Huston Smith enters the Hall of Fame of the scholars of religion holding a book, which originally bore the title: The Religions of Man (1958) and subsequently The World’s Religions (1991), after it had been revised. Together these two versions have sold over three million copies. Wilfred Cantwell Smith said of this book that it made the (academic) study of religion possible. This is not an exaggeration, and I have used it throughout my professional life to introduce students, at all levels, to the world’s religions. Every religion possesses a quality which exceeds its contents, but to be able to convey that quality, when most books stop with contents, is an intellectual and pedagogical achievement of the highest order. Huston Smith made many other contributions to the study of religion in the course of his distinguished career: he broke new ground in analyzing the relation of drugs to religious experience; he participated in the debate in the study of mysticism on whether language was constitutive or expressive of mystical experience; he tried to rescue the indigenous religious traditions from neglect in the study of religion; he examined the vexed relationship between modernity and religion; and he vigorously upheld the perennial philosophy perspective in the study of religion when it was considered unfashionable to do so. And so on. But to introduce generations of students to the various religious traditions of humanity, in such a way that followers of these various traditions fully recognize themselves in these descriptions, remains for me Huston Smith’s most remarkable contribution to our field. He remarked good-humoredly that he had been “charged” with belonging to all the traditions he had described in The Religions of Man. Arvind Sharma is the Birks Professor in Comparative Religion in the School of Religious Studies at McGill University. A friend and colleague of Huston Smith, Sharma edited a Festschrift in honor of Smith in 1991, Fragments of Infinity.